Jean Hasler from the March of Dimes (bottom left) presents Shelly Keehn and Jill Martin of Associated Bank with a plaque for participation in the March of Dimes walk on April 28, 2012. 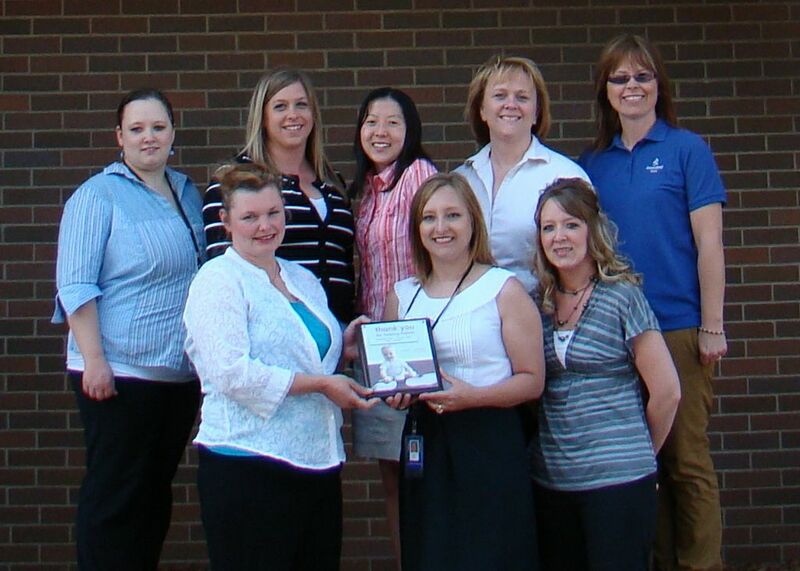 Pictured in back row are Holly Roman, Denise Gaede, Anda Klemp-Hawig, Heather Wynn and Tammy Davis. Over 12 Associated Bank colleagues from the Stevens Point Service Center raised $3,867 for the March of Dimes walk on April 28, 2012. Shelly Keehn, Customer Service Representative at the service center, was more than happy to pursue this opportunity and coordinate a team. ABC TEAMSTERS was developed and Keehn's colleagues were invited to participate by walking and pledging money. "As Associated is a strong supporter of community service, I searched our database of opportunities and thought this would be a perfect fit, as so many of my friends and family have benefitted from March of Dimes," said Keehn. With support from Lorraine Avery, Director of Customer Service and Jenny Fox, Manager of Customer Care, money was also raised through Casual for a Cause week fundraisers that raised $2,935. Associated encourages and supports colleague volunteerism efforts in our communities by proactively working to connect colleagues with non-profit organizations that meet their personal passion for community involvement. ABC TEAMSTERS included: Shelly Keehn, Daniel Keehn, Gage Keehn, Chase Keehn, Quade Keehn, Sherry Janiszewski, Tammy Davis, Mary Saeger, Kelsi Saeger, Brenda Janiszewski, Tracy Wojcik, Heather Wynn, Jill Martin, Kinzee Martin, Kayleigh Steinbeck, Elizabeth Glasser, Katie Kulas, Denise Gaede, Morgan Gaede, Peyton Gaede, Brandon Wormet, Maysen Wormet, Stephanie Seavers, Holly Roman, Anda KlempHawig, Lexi Klemp-North, Cade Klemp-North, Joe Hawig, Pam Engevold, Isaac Engevold and Aiden Engvold.